A recent filing in a Section 337 investigation that the U.S. International Trade Commission (ITC) is conducting into whether a number of aftermarket supplies firms infringed Canon’s toner cartridge patents (investigation number 337-TA-1106) caught our attention. It indicates that Canon has inspected certain newly redesigned Ninestar cartridges and that Canon is not accusing these cartridges of infringing the asserted patents. Moreover, Canon acknowledges that these cartridges will not be impacted by whatever remedial orders the ITC may issue at the conclusion of the ITC investigation. In the aftermarket supplies industry these days, that is about as good a declaration of non-infringement as you can get. Canon shook up the aftermarket supplies industry in February by requesting that the ITC open a new Section 337 investigation into alleged infringement of its toner cartridge patents and filing 36 parallel patent-infringement lawsuits in U.S. federal courts (see “Canon Causes Another Cataclysm: OEM Sues Numerous Aftermarket Firms for Patent Infringement”). The litigation named as defendants 49 companies in total, including the Ninestar group of companies and Ninestar subsidiary Static Control Components. What made this case especially interesting is that it targeted the so-called non-infringing aftermarket cartridges, most of them new-build compatibles but also some remanufactured cartridges using newly manufactured gear, brought to market after a previous Canon toner cartridge investigation, the 337-TA-918 investigation, resulted in the ITC issuing a general exclusion order (GEO) in 2015 (see “ITC Awards Canon GEO in Dongle Gear Investigation”). The 337-TA-918 GEO covered five patents on the OEM’s dongle gear designs, a coupling used to connect a toner cartridge to the drive motor inside a printer. To target the aftermarket’s workaround solutions, Canon closely studied the various aftermarket alternatives to the dongle gear coupling and obtained continuation patents throughout 2017 and 2018 that theoretically make the “non-infringing” design workarounds to the dongle gear infringing. Canon then filed complaints against aftermarket supplies companies alleging infringement of these newer patents. But just as the aftermarket did not wish to cede the lucrative market for Canon and HP toner cartridges following the dongle gear litigation of 2014/2015, the aftermarket got to work following Canon filing its new litigation to develop new cartridge designs that would avoid infringing the newer set of Canon patents. In the months since Canon filed suit, several firms have stated that they either already have or soon will have newly redesigned aftermarket solutions. To date, we have seen such announcements from Aster (see “Aster Announces Patented, Non-Infringing Dongle Gear Alternative”), Print-Rite (see “Print-Rite Unveils PR3 Gear Design It Says Is Patent-Safe”), LD Products (see “LD Products Speaks Out on Canon Litigation”), and Ninestar (see “Ninestar Releases Replacement HP Toner Cartridges with New Dongle Gear Workaround”), as well as from Ninestar subsidiary Static Control Components. 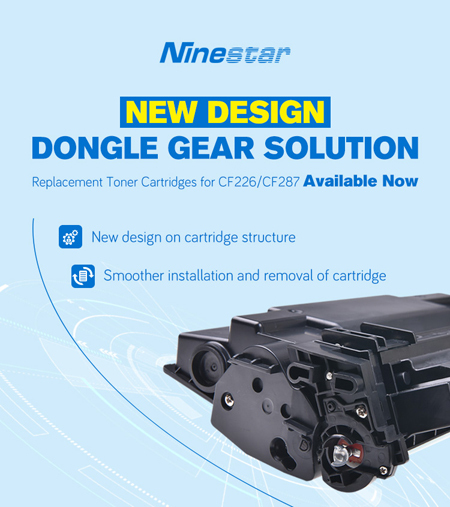 Ninestar’s newly redesigned toner cartridges include alternatives to the HP CF226/CF287 series and HP CE505/CF280. HP’s CF226 series toner cartridges include the HP 26A (CF226A) and HP 26X (CF226X), which are HP/Canon JetIntelligence toner cartridges. These cartridges were introduced in the A4 monochrome LaserJet Pro M402n/dn/40dw and LaserJet Pro MFP M426dw/426fdn/426fdw in 2015 (see “HP Debuts JetIntelligence-Based LaserJet 400 Series A4 Color and Mono Printers and MFPs”). HP’s 87A (CF287A) standard-yield toner cartridge and HP 87X (CF287X) high-yield toner cartridge also feature JetIntelligence technology and were introduced in 2015 in the HP LaserJet Enterprise M506n/dn/x and HP LaserJet Enterprise MFP M527dn/f/c/z A4 monochrome lasers (see “HP Makes Security the Focus with JetIntelligence-Based LaserJet 500 Series”). The HP 80A (CF280A) and HP 80X (CF280X) are used in the LaserJet Pro 400 M401 series and HP LaserJet Pro 400 MFP M425dn, which were introduced in 2012 (see “HP Launches Several New LaserJet Devices for Businesses at Global Influencer Summit”). Finally, the CE505A (05A) and CE505X (05X) toner cartridges are used in various HP monochrome laser devices, including the HP LaserJet P2035/2054/2055/2056/2057 series from several years ago. On July 18, Canon, the Office of Unfair Import Investigations, and the respondents defending themselves in the investigation (Aster, Ninestar, Static Control Components, Print-Rite, ACM Technologies, LD Products, and The Supplies Guys) filed a “joint stipulation regarding representative accused products.” Its purpose is to lay out exactly which accused products are accused of infringing which Canon patent claims. It should be noted that over the course of the investigation, Canon has narrowed the number of patents and patent claims it is asserting. To date, it has dropped two patents entirely from the complaint and investigation as well as certain claims of the other remaining seven patents (see “Canon Amends ITC Complaint to Assert Fewer Patents, Sees More Settlements and Defaults”). 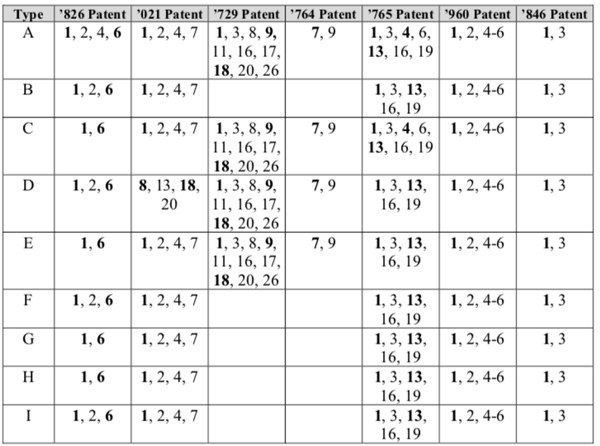 The stipulation divvies up the accused products into certain representative groups (Type A, B, C, D, E, F, G, H, and I) and lists the specific claims of the seven patents asserted that are allegedly infringed by these various representative groups (see table below). > NT-PH505XC_SW2 products having the same design as the physical samples produced with Bates numbers NINESTAR P0009A-C. These are doubtless the newly redesigned dongle gear cartridges that Ninestar announced in June because Ninestar’s previous solutions, which used its BlueDrive gear, are among the cartridges that Canon is accusing of infringing. Canon has requested that the ITC issue a general exclusion order (GEO) or in the alternative a limited exclusion order (LEO), as well as cease-and-desist orders, as remedy for the alleged infringement. In this filing, Canon is admitting that Ninestar’s redesigned cartridges do not infringe the asserted patents and that they would not be subject to any exclusion order the ITC may issue. In other words, the products are in the clear and do not infringe. That said, there’s one caveat: there’s no guarantee that Canon won’t go and obtain additional continuation patents in the future that could potentially make the new cartridges infringe. But that’s a pretty big what-if at this point and will probably depend on whether Canon succeeds in getting the ITC to find in its favor in the current investigation. Canon’s admission is good news for Ninestar and its efforts to market and sell its newly redesigned solution, as this certainly bolsters Ninestar’s claims of non-infringement. In June, Static Control Components announced its redesigned dongle gear cartridges. In its announcement, Static stated, “We have a design around that Canon admits does not infringe or violate the asserted patents in the ITC investigation [emphasis as per original].” As a Ninestar subsidiary, the new-build compatible cartridges sold by Static Control are made by Ninestar, although it is our understanding that Static has input into the designs it sells and some of the Static products use a different build of materials. The joint stipulation regarding representative accused products shows why Static Control was comfortable enough to assert that Canon had admitted the redesigned cartridges do not infringe. As the various design-around new-build cartridges launched since Canon filed suit in February shows, Canon’s litigation is not a mighty death blow to the aftermarket. Nor does it mean the OEM will get new-build compatibles for Canon and HP toner cartridges off the market and reclaim enormous market share. Aftermarket makers are in this battle for the long haul and will not cede the profitable market for Canon/HP toner cartridges used in the enormous installed base of HP LaserJet devices willingly. We see Canon’s subsequent waves of toner cartridge gear litigation (first the twisted prism gear litigation of 2012/2013, then the dongle gear litigation of 2014/2015, and now the new dongle gear litigation) as part of a broader strategy to inflict upon the aftermarket if not death than at least significant pain through a thousand cuts. Each new wave of Canon litigation costs the aftermarket supplies companies named in Canon’s lawsuits—there are legal fees, potentially settlement costs, the huge cost involved in developing new designs, and the costs and hassle of changing over inventories from one design to another. Moreover, the publicity surrounding each wave of lawsuits is a black eye for the aftermarket industry and raises concerns among channel players about which aftermarket products, if any, are “safe” to carry. But Canon cannot stop the aftermarket supplies industry from developing new solutions to try to get around its patents and, as Canon’s admission demonstrates, Ninestar has succeeded in doing just that. We wonder if we will soon see more settlements in the Canon litigation. Now that the aftermarket is already busy bringing its newly redesigned solutions to market, we suspect that some of the remaining respondents will feel defending their previous solutions from Canon’s claims of infringement is less imperative. That is something we will be watching moving forward.